Well its not really big enough for me to fit into it but I cant really afford the real size one. 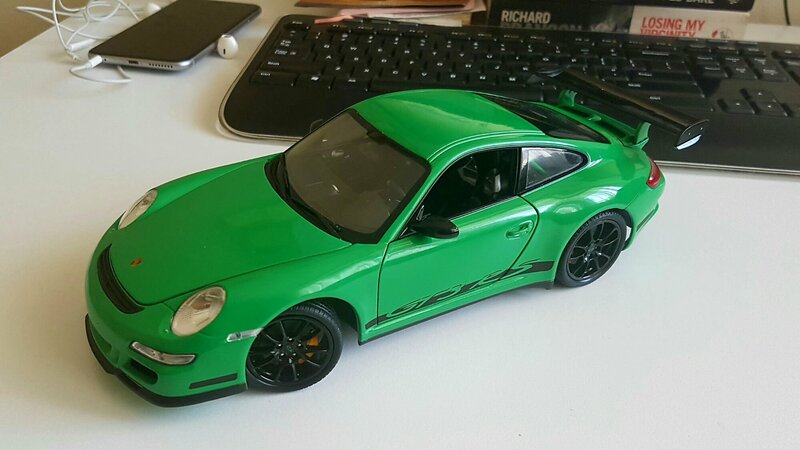 Its a 1/18 scale model of the Porsche 911 (997) GT3 RS from 2007. I had a $5k deposit on one with Porsche back in 2007. 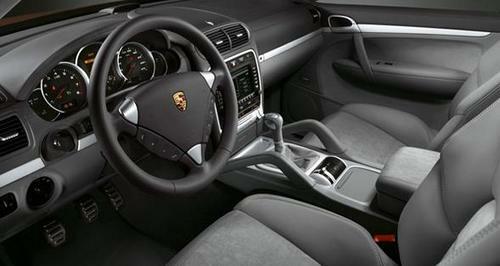 I chickened out taking out the finance when Porsche asked me to come in and spec the car. I should have gone for it, back then the car cost $300k approx aussie $ but now they are worth nearly double that, being such a award winning and limited production run Porsche. It would have been an investment, even if I only owned it for 6 months. I kicked myself when I saw how much they went up in value. The model is from Welly who makes some pretty decent models with a lot of detail as you can see. All the doors open, boot, bonnet and the steering wheel turns wheels. The paintwork has been painted and glossed really well. 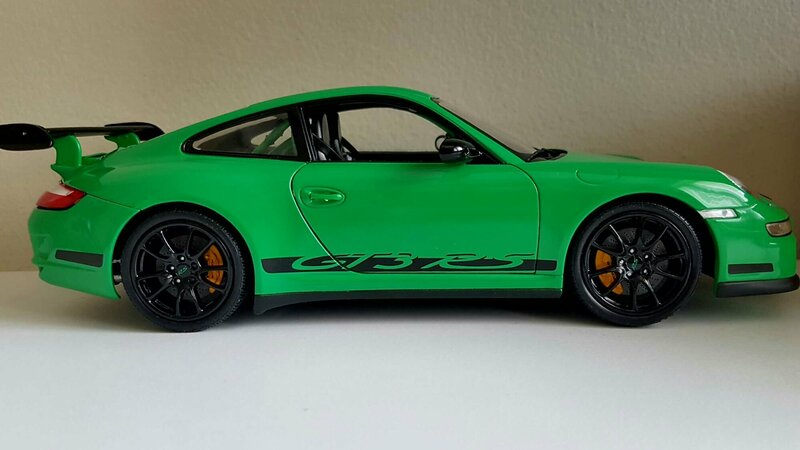 The colour might offend some, but the kermit Green and bright Orange were the 2 colours this GT3 RS model was famous for. You can even see a bit of a map on the sat nav. Porsche Australia recently unveiled their new Cayenne GTS Prestige 4WD, adding to the existing lineup of Cayenne, Cayenne S and range topping Cayenne Turbo models. Im still wondering who actually goes out and buys these things in Australia though. I mean no one I know actually admits to wanting to go and buy one of these no-man-land 4WD’s stuck between the world of prestige and a raw 4WD off-roader but I see more and more of these things driving around the state capitals of Australia everyday. The new Cayenne GTS sits between the top 2 models of the range between the S model with its 4,8l V8 and 405hp and the range topping massively expensive turbo model with its 4.8l twin-turbo V8 creating a massive 500hp and 700Nm of torque, enough to haul Tasmania back to the mainland Australia! Turbo nose and mouth lifted from the top spec Turbo model. At $153 thousand dollars incl. GST it sits well below the price of the Turbo which costs an unimaginable $215k for a 4WD SUV, but for an extra $19k over the Cayenne S model what do you get extra in the Cayenne GTS. Well V8 power plant has been tweaked, the engine now generates an extra 20hp but torque remains the same at 500Nm ?? (is that a typo in the press release??) acceleration from 6.8 seconds to 100kph is down to 6.1 seconds and top speed is raised from 250kpm to 253kph, all this from a revised intake manifold and engine management system wow! hmmmm not. Twin Rear chrome tailpipes taken from the Turbo model. What this translates to is the optional Cayenne sports exhaust system, 24mm lower steel-sprung sports suspension with PASM (Porsche Active Suspension Management) and 21-inch Cayenne Sport wheels all fitted as standard. On the looks department the Cayenne GTS has all the visual trimmings of the Turbo model so if you ‘de-badge’ the car you could pretend to owning the Cayene Turbo model if that gives you one up on the Jones’s. A free optional roof spoiler on the roof tail edge adds the ‘bling’ for this new faster models looks too. 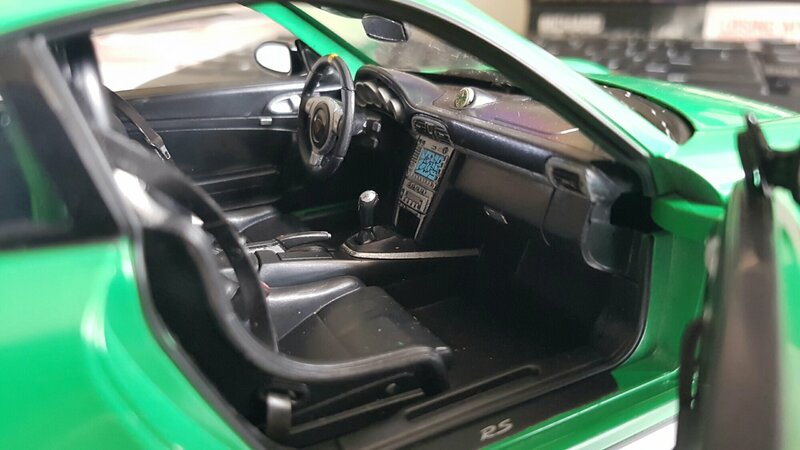 Interior doesn’t get any real highlights over the S model. 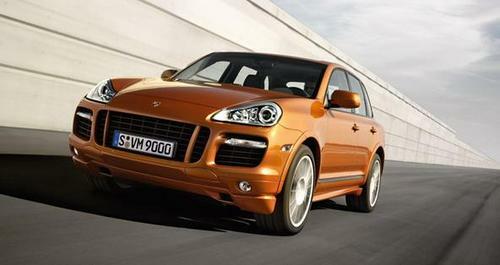 Back to where I started with this though, who actually buys Porsche Cayenne’s? If you want practicality you go for an old tough as boots Toyota Landcruiser, you want ‘cheap’ luxury you go for the ever more popular in Australia Ford Territory. 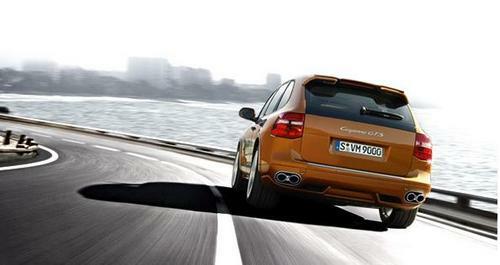 Who buys a Cayenne and actually takes them off-road like a 4WD is meant to? It seems only Porsche in their own motor journo driving PR adventures around the world to end up in various beautifully crafted Porsche sales brochures in showrooms around the world, certainly not the ones in Sydney.